I was recently given the opportunity to review the complete third season of this legendary TV series. This set contains all 37 classic episodes on 5 discs and has no special features. Nothing wrong with that for what really amounts to being a budget release containing the goods that really matter…the groundbreaking stories themselves. The presentation is as good as you will ever find for this series. It is presented in its original black & white 1.33:1 aspect ratio. The audio is presented in Dolby Digital Mono, which more than does the job. All in all, I believe any fan will be pleased. Some of the real standout entries include: The Mirror, The Grave, Two (a young Charles Bronson shines brightly here), The Dummy (personal fave) and To Serve Man – among others. Anyone who has not watched this series – season 3 in particular – since last having seen them in reruns or marathons on various TV stations, really owe it to themselves to check this no-frills set out. Hopefully a release like this can bring in a whole new generation of fans. The material holds up to this day, as long as some younger viewers can get passed the “black & white” presentation. So many future stars were introduced to the world during this season of the series; Charles Bronson (did I mention he is awesome in this? ), Carol Burnett, Robert Redford, Leonard Nimoy, and many others. For its reasonable price and faithful presentation with 16 hours of classic material, I highly recommend this box set. 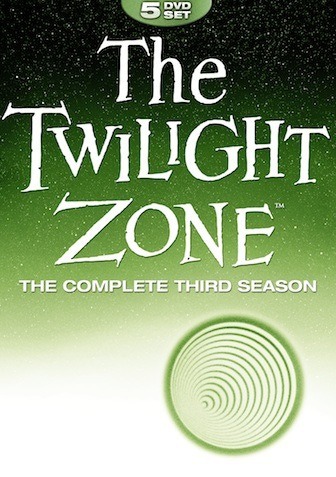 If you were already a fan before and don’t already own this season of The Twilight Zone, then a purchase is an absolute no-brainer. I give it a high recommendation. This stuff is timeless. I may have to check out the other seasons as well when I have a chance. This entry was posted in TV Shows and tagged charles bronson, image entertainment, rod serling, the dummy, the twilight zone, the twilight zone season 3. Bookmark the permalink. Man – this is a GREAT idea!! I’ve been watching the entire series of Deadwood and The Twilight Zone is a great idea to follow up – good stuff! I began watching “The Twilight Zone” series on Netflix. I had seen a number of the episodes over the years, but I had never had the opportunity to watch all of the episodes by season and in the order they first aired on television. I began watching season one, and it didn’t take me that long to finish it. I watched season two, and when it was finished, I expected Netflix to automatically shift to the first episode of season three, but for some unexplained reason they had removed the other seasons of the show from instant streaming that had been there when I first started watching. Needless to say I wasn’t happy about it, but at least I will be able to start watching them through the mail order. That’s the beauty of these sets…so cheap and accessible.